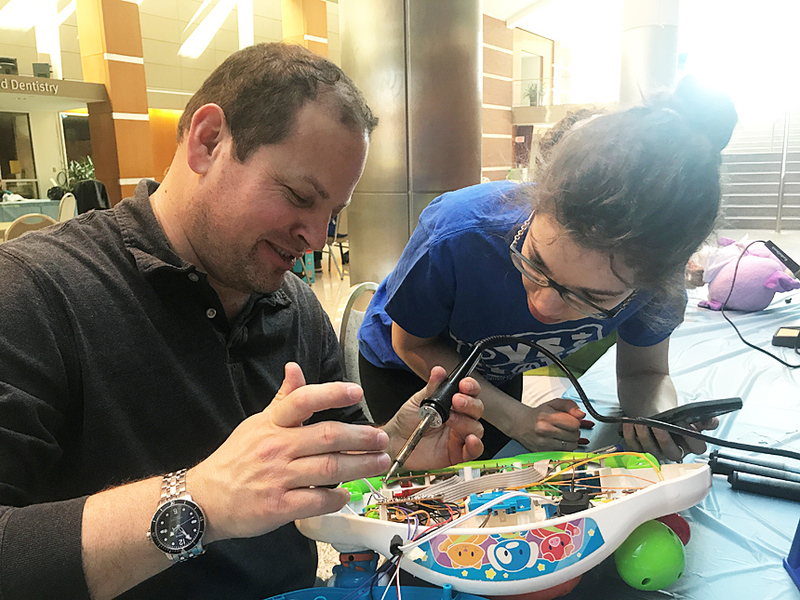 For children with severely impaired movement or other disabilities, the simple act of playing with a toy can be a huge motivation. And yet, there is an acute shortage of toys for children with special needs to activate on their own. 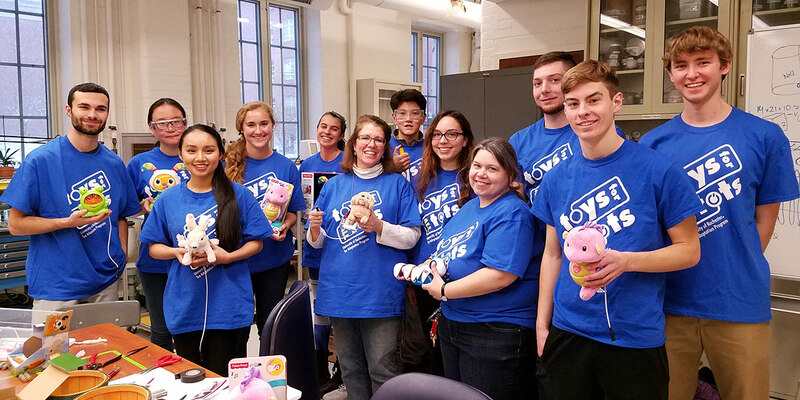 Toys for All Tots, a student organization at the University of Rochester, accepts lightly used or new battery-operated toys, then adapts them with special switches so special needs children can use them. This gives the children a strong sense of empowerment—and a strong motivation to develop other skills. 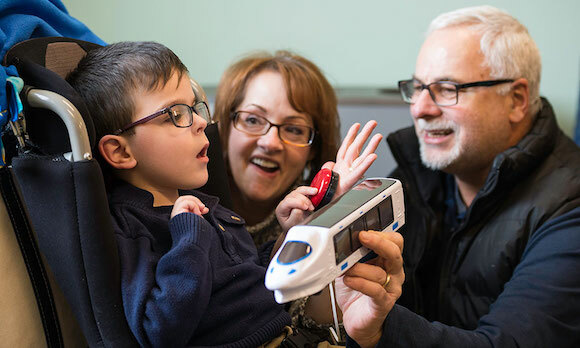 For example, pediatric physical therapists at Golisano Children’s Hospital at the University say special needs children are motivated to practice therapy exercises such as walking across a room when they see a an adapted toy waiting for them on the other side. Cause and effect developmental learning from activating a toy can stimulate acquiring additional skills for those with limited mobility. 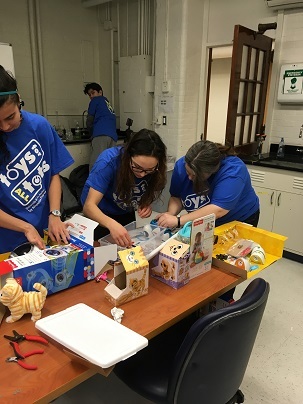 Toys for All Tots, based on a program begun at Ohio State University, is also interested in reaching out to schools and other organizations, to train others to adapt the toys. Where will the toys be used? Golisano Hospital, which serves a large population of special needs children from across Upstate New York. Examples of toys suitable for adapting: Toys with lights, sounds, and movement such as Tickle-Me Elmo, bubble machines, dancing plush animals, plastic bug/animal music players. Toys with simple on/off activation are easier to adapt. 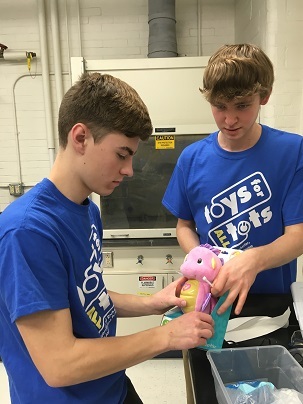 To donate a toy: Toys can be mailed or dropped off at the Department of Chemical Engineering. 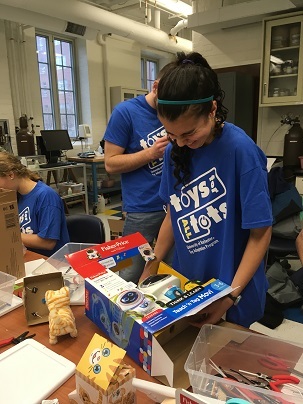 To learn more about participating in Toys for All Tots, contact Rachel Monfredo, lecturer for the Department of Chemical Engineering at rachel.monfredo@rochester.edu or our student group at URochesterTAP@gmail.com. To learn more about our activities and events follow us on Facebook at toyadaptionprogram. 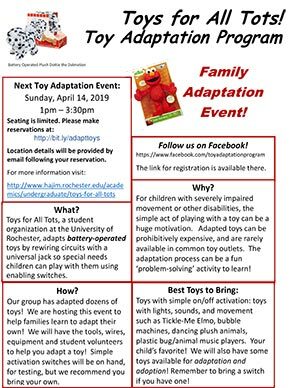 The Toys for All Tots student organization hosts a workshop to teach parents of special needs children how adapt battery-powered toys on their own. 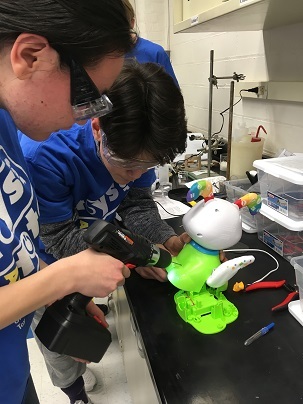 The Toys for All Tots student organization hosts workshops to teach other students and community members how to adapt battery-powered toys so that children with limited mobility can activate them on their own.